This study sought to validate clinical measures of urine concentration against the criterion standard, urine osmolality. During preparticipation physical examinations, athletic trainers identified collegiate football players and monitored hydration status (n = 69 samples) during preseason practices. Participants were Division I collegiate American football players (n = 5; mean age, 20.4±0.5 years; mean mass = 118.7±17.8 kg; mean height = 183.6±5.8 cm). Urine samples were analyzed for urine specific gravity using refractometry, urine color, 2 brands of urine reagent strips, and urine osmolality. The relationship of the variables was assessed using Pearson and Spearman’s rho correlations. Results showed a strong correlation between urine osmolality and clinical refractometry (Pearson, r = .872), a marked correlation between urine osmolality and both urine reagent strips (Spearman’s rho, r = .647 and .626), and a moderate correlation between urine osmolality and urine color (Spearman’s rho, r = .540). With other measures, clinical refractometry is a valid field measure of urine concentration. Dr Eberman is from the Department of Athletic Training, Indiana State University, Terre Haute, Ind; Ms Minton is from the Department of Physical Education, University of South Carolina, Columbia, SC; and Dr Cleary is from the Department of Kinesiology and Rehabilitation, University of Hawaii at Manoa, Honolulu, Hawaii. Address correspondence to Lindsey E. Eberman PhD, ATC, LAT, Department of Athletic Training, Indiana State University, 401 North 4th Street, Arena C-10, Terre Haute, IN 47809; e-mail: leberman@indstate.edu. Hypohydration is a contributing factor to rises in core body temperature and therefore predisposes athletes exercising in hot, humid conditions to the onset of exertional heat illness1–3 and subsequent loss of playing time, altered performance, and decreased overall health.2 To prevent and recognize the occurrence of exertional heat illness, health care professionals should be proactive with populations at risk for exertional heat illness. Prophylactically measuring hydration status and monitoring patients between exercise sessions is required to prevent exertional heat illness, particularly in susceptible individuals. Although the National Athletic Trainers’ Association (NATA) and the American College of Sports Medicine suggest the use of a clinical refractometer,1,3 which is supported by other research,4,11–14 urine reagent strips are still widely used among many health care professionals.15–17 Previous research6,9,11–15 has compared urine reagent strips to clinical refractometry; however, these investigations have failed to draw comparisons to the criterion standard of urine osmolality. The purpose of this research was to determine the validity of common clinical measures of urine (clinical refractometer, urine reagent strips, and urine color) compared to urine osmolality. 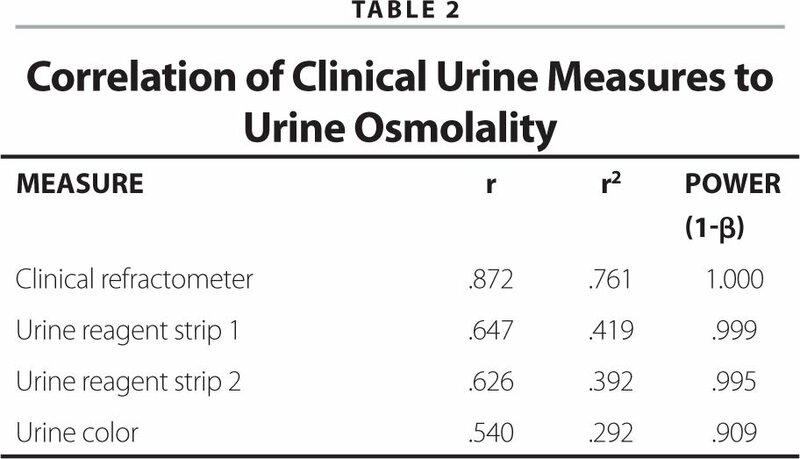 This study used a nonexperimental, observational research design to compare urine osmolality to a clinical refractometer, 2 brands of urine reagent strips, and urine color. The Heat Illness Index Score (HIIS) Risk Assessment18 was used to identify at-risk athletes on a Division I-A collegiate American football team. The HIIS is a 10-item questionnaire designed to identify risk factors of exertional heat illness during the preparticipation physical examination.18 This screening instrument was examined by 6 expert panelists in a Delphi panel investigation to estimate content validity of the instrument.18 Using this instrument, 5 at-risk athletes were identified, and samples of their urine were obtained before and after practice during 15 days of preseason football practice. During the pilot implementation of the HIIS Risk Assessment, athletic trainers identified 5 players at moderate risk for exertional heat illness (mean age, 20.4±0.5 years; mean body weight = 118.7±17.8 kg; mean height = 183.6±5.8 cm). Hydration status was monitored in these at-risk players throughout preseason football practices in a hot, humid environment (mean on-field wet-bulb globe temperature = 28.84°±2.36°C). Participants were informed of the risks and benefits of participation, and all participants completed an informed consent form, approved by the university’s Institutional Review Board. The goal was to capture 150 samples during the course of the 15 days of preseason football practices, but due to participant noncompliance, a total of 69 samples were collected and analyzed. Only between measurement techniques for each individual urine sample were compared rather than comparisons between participants or samples; therefore the conditions (eg, time of day, level of dehydration, prepractice or postpractice) of data acquisition were not controlled. Urine Osmolality. An osmometer (μOsmette; Precision Systems, Natick, Mass) was used with the freezing point depression technique to measure urine osmolality. Osmolality, dependent on the number of particles in the solution but not affected by the weight or charge of the particles,4 is the most effective measurement of total solute concentration and the best method of estimating kidney function.7 An osmometer is used to compare the specimen to the freezing point of water (1.86°C).4 Urine osmolality is far more expensive, requires technical knowledge to perform, and is not a likely instrument to be used in the athletic training clinical or field setting. Because urine osmolality is the criterion standard for estimating urine concentration, it was used as the criterion measure in this investigation. The osmometer was calibrated at the beginning of each data collection session according to the manufacturer’s instructions. Descriptive statistics were calculated for all urine indices. Urine osmolality, urine specific gravity, and urine color were measured for each individual sample, and correlations between measurement techniques were calculated. Because the scale of measurements for urine osmolality, urine specific gravity, and urine color are different, both Pearson and Spearman’s rho correlations were used to describe the strength of relationships.19 Spearman’s rho correlations were used for calculations including urine reagent strip measures because of the ordinal characteristics of the variable. Significance was set a priori at P ≤ .05. Measures of urine indices demonstrated participants were significantly hypohydrated (Table 1) according to the standards described by the NATA position statement on Fluid Replacement.1 A strong correlation was found between urine osmolality and the clinical refractometer (Figure), a marked degree of correlation was found between urine osmolality and both reagent strips, and a moderate correlation was found between urine osmolality and urine color (Table 2). Figure. 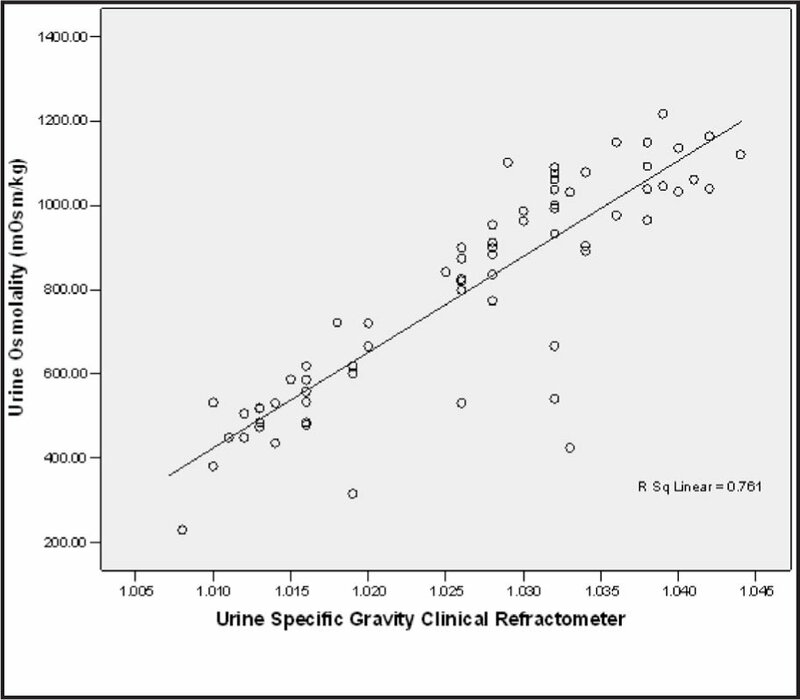 Linear Relationship Between Urine Osmolality and Refractometer Measures of Urine Specific Gravity. According to previous research, urine color does not provide the accuracy or precision of urine specific gravity.7 Our findings suggest urine color is even less effective than urine reagent strips and therefore is not the most effective method of clinically measuring hydration status. However, urine color may be an effective tool in educating athletes about assessing their own hydration status and on further investigation, may be a valid self-assessment of hydration. This investigation focused on clinical or field measures of hydration status during both the preparticipation physical examination and during the course of several preseason football practices. During the preparticipation physical examination, which was a single-measurement session, we were unable to measure body weight changes or total body water losses. Furthermore, as this was a field experiment, we did not use blood measures, such as plasma osmolality, to confirm our results. We believe our results have clear clinical implications for the practitioner, and combined with additional field measures of hydration status such as body mass changes, our findings suggest refractometry is the most valid field measure for urine concentration. Preparticipation hydration assessment is one of many intrinsic characteristics that can effectively identify at-risk athletes and may be helpful in preventing heat-related illness. Educators are responsible for advising future clinicians in selecting an instrument that is practical and inexpensive, and does not require technical operation yet provides valid measurements of urine concentration in the athletic training setting. 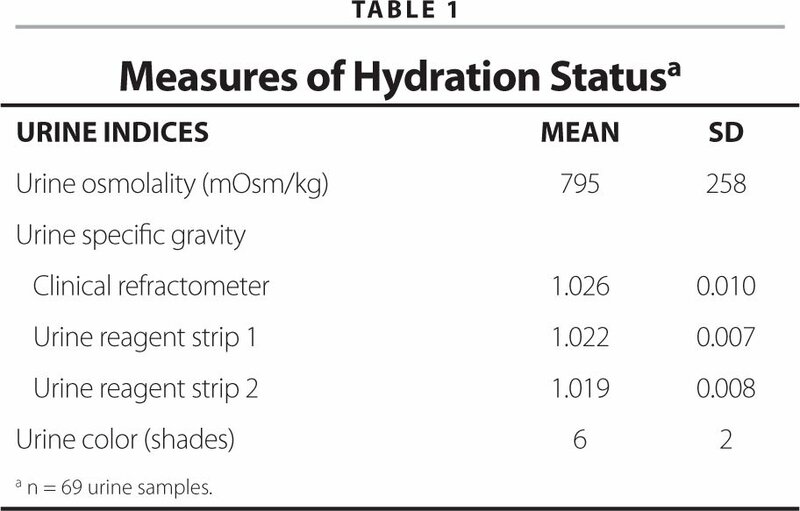 Our findings suggest the clinical refractometer is a valid clinical measure of urine specific gravity and should be used for pre-participation assessment of hydration status. Furthermore, refractometry measures of urine specific gravity should be used in conjunction with change in body mass and urine color to monitor the hydration status of at-risk athletes exercising in hot, humid environments. Casa DJ, Armstrong LE, Hillman SK, et al. National Athletic Trainers’ Association position statement: Fluid replacement for athletes. J Athl Train. 2000;35:212–224. Sawka MN, Burke LM, Eichner ER, Maughan RJ, Montain SJ, Stachenfeld NSfor American College of Sports Medicine. American College of Sports Medicine position stand: Exercise and fluid replacement. Med Sci Sports Exerc. 2007;39:377–390. Armstrong LE. Assessing hydration status: The elusive gold standard. J Am Coll Nutr. 2007;26(suppl):575S–584S. Cheuvront SN, Sawka MN. Hydration assessment of athletes. Sports Science Exchange #97. 2005;18:1–6. Stuempfle KJ, Drury DG. Comparison of 3 methods to assess urine specific gravity in collegiate wrestlers. J Athl Train. 2003;38:315–319. National Collegiate Athletic Association Wrestling Rules Committee. 1998–1999 Wrestling Weight Certification Program. Indianapolis, IN: National Collegiate Athletic Association; 1998. McCrossin T, Roy LP. Comparison of hydrometry, refractometry, osmometry and Ames N-Multistix SG in estimation of urinary concentration. Aust Paediatr J. 1985;21:185–188. Popowski LA, Oppliger RA, Lambert GP, Johnson RF, Johnson AK, Gisolfi CV. Blood and urinary measures of hydration status during progressive acute dehydration. Med Sci Sports Exerc. 2001;33:747–753. Zaloga GP. Evaluation of bedside testing options for the critical care unit. Chest. 1990;97(suppl):185S–190S. Gounden D, Newall RG. Urine specific gravity measurements: Comparison of a new reagent strip method with existing methodologies, as applied to the water concentration/dilution tests. Curr Med Res Opin. 1983;8:375–381. Ito K, Niwa M, Koba T. Study of urinary specific gravity by reagent strip method. Tokai J Exp Clin Med. 1983;8:247–255. Eberman LE, Cleary MA. Validation of the Heat Illness Index Score risk assessment. J Athl Train. 2007;42:S52. Hinkle DE, Wiersma W, Jurs SG. Applied Statistics for the Behavioral Sciences (5th ed). Boston, MA: Houghton Mifflin Co; 2002. Oppliger RA, Magnes SA, Popowoski LA, Gisolfi CV. Accuracy of urine specific gravity and osmolality as indicators of hydration status. Int J Sport Nutr Exerc Metab. 2005;15:236–251. National Athletic Trainers’ Association Executive Committee for Education. Athletic Training Educational competencies4th edition (Medical Conditions and Diseases: Psychomotor Competency 4.0), 2006. Armstrong LE, Maresh CM, Castellani JW, et al. Urinary indices of hydration status. Int J Sport Nutr. 1994;4:265–279. Armstrong LE, Soto JA, Hacker FT Jr, Casa DJ, Kavouras SA, Maresh CM. Urinary indices during dehydration, exercise, and rehydration. Int J Sport Nutr. 1998;8:345–355. Wilson LA. Urinalysis. Nurs Stand. 2005;19(35):51–54. Adams LJ. Evaluation of Ames Multistix-SG for urine specific gravity versus refractometer specific gravity. Am J Clin Pathol. 1983;80:871–873. Brandon CA. Urine specific gravity measurement: Reagent strip versus refractometer. Clin Lab Sci. 1994;7:308–310. Zack JF Jr, . Evaluation of a specific gravity test strip. Clin Chem. 1983;29:210.